The Ultimate Black Belt Test 2018 has welcomed my friend and non-martial artist, Keshia Thomas, into the UBBT as a guest member. This means Keshia will build a 1-year training curriculum around fitness, diet, and things she's working on accomplishing --and work alongside us as we train, diet, and work on our "stuff" too. 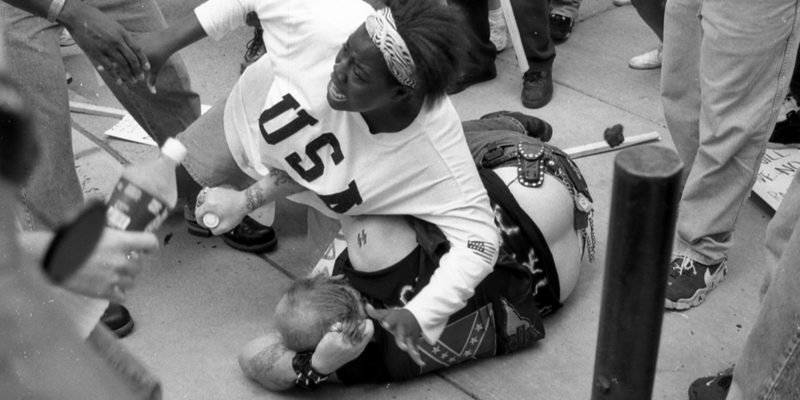 Keshia Thomas, the young lady in the iconic photo by photographer Mark Brunner, which has been called one of our century's most important photographs and was Life Magazine's "Picture of the Year" in 1996, is a civil rights and social justice activist. I've been working with Keshia for a few years, helping her with her work --and getting help from her with mine. To read up on Keshia's most well known act of heroism, here's a BBC News piece entitled "The teenager who saved a man with an SS tattoo." Here's another from Ann Arbor News. And here's a more recent story outlining how Keshia has been helping Hurricane Harvey victims. My goal with having Keshia involved is not only to help her with her own ambitions, but to have her mindset and her work-in-the-world have an influence on the martial arts master teachers who engage the UBBT. One of the master teachers who has started his 11th year in the UBBT process with The Ultimate Black Belt Test 2018, is Canadian kung fu stylist Jeff Brinker of Silent River King Fu. In his most recent test journal entry, he discusses the 538,850 push-ups he's done since beginning --and what he's adjusting to protect his body. As for my own training, it's been "training lite" this last week, due to the fact that I'm packing up my house, have purchased an Airstream, and am planning, along with my partner Elizabeth, to hit the road in 2018 visiting martial arts schools and seeing the Pacific Northwest more carefully. I'll keep you in the loop as the journey progresses.